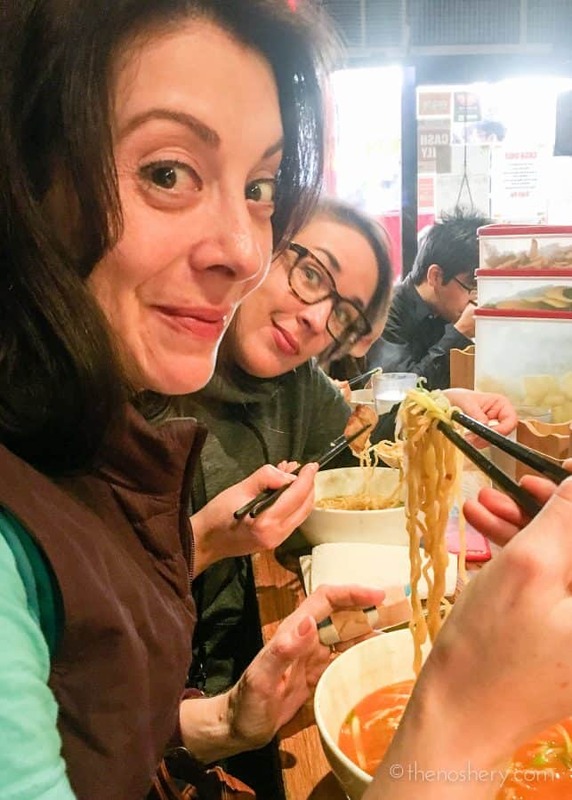 What happens when three food bloggers visit New York City? They eat of course! It’s probably not a surprise that our main goal while in New York City was food. Well before we headed out to New York City I had reservations for dinner and a list of possible places to eat. Today I am going to share you some great New York City cheap eats. The first night we arrived we met up with my cousin for dinner, who is a very talented jewelry designer in Brooklyn, NY. 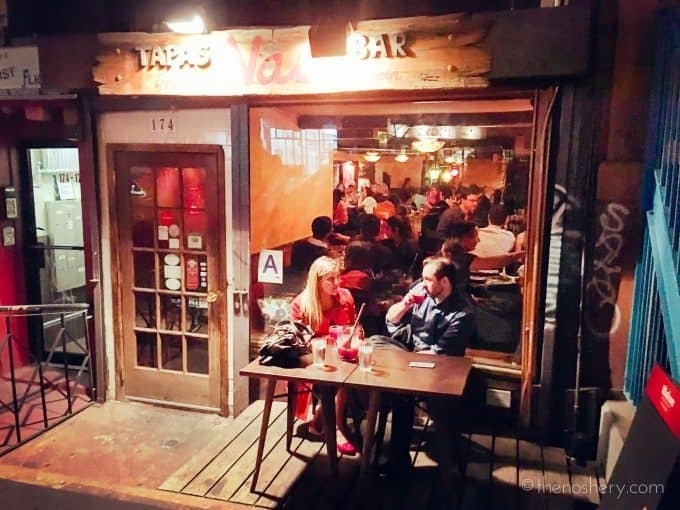 We meet at Nai Tapas Bar in the East Village.The restaurant is very simple and rustic with dark hardwood everywhere. For a New York restaurant, it’s very comfortable. They serve traditional Spanish tapas and even have live Flamenco performances on the weekend. We ordered about eight tapas between the four of us and everything was fabulous. My favorite was the empanadillas de carne (beef turnovers) and aguacate relleno (avocado stuffed with lump crab meat)! But everything was fabulous and we left with full happy full bellies. We walked out spending just over $20 each! Our first morning in New York City we walked over to Russ & Daughters Cafe on Orchard St. Russ & Daughters Cafe opened in 2014 a branch off from the Russ & Daughters store around the corner on Houston St. 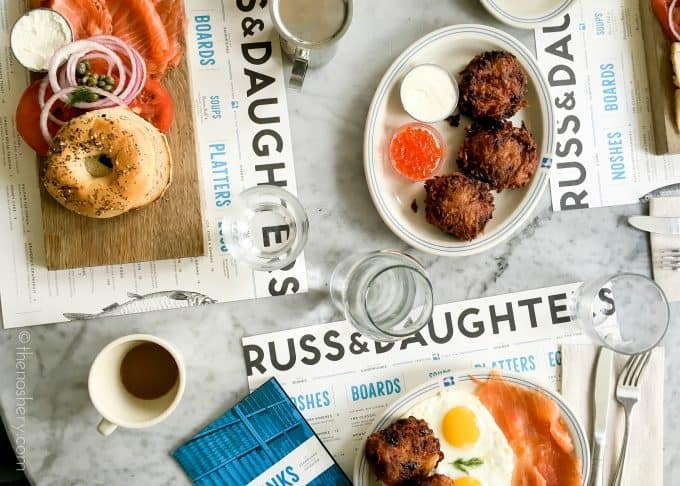 The original Russ & Daughters store opened in 1914. 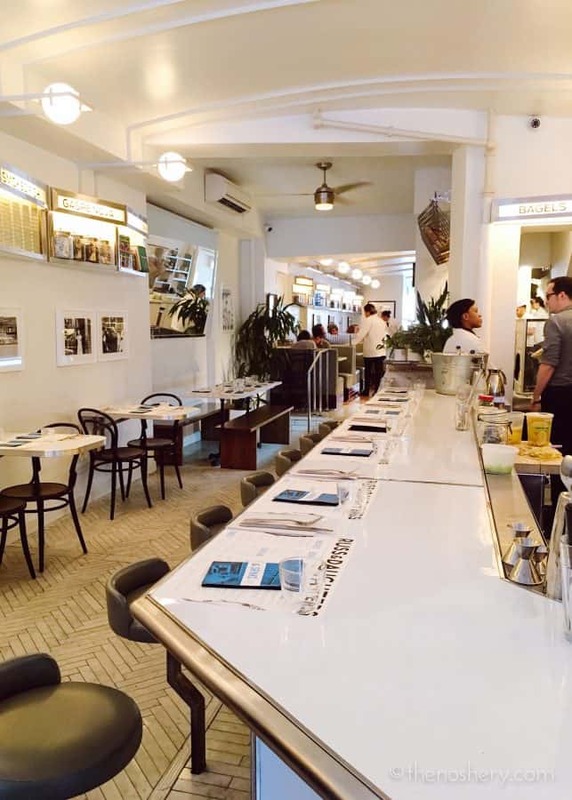 It’s a New York City institution and four generations later it’s still run by the same family. This cafe is adorable! It’s bright, open, with blue details and a vintage feel. The waiters even wear white jacket with black bow ties. We were sat in a corner booth all the way in the back with a frosted window that produced the perfect lighting. A food bloggers dream! 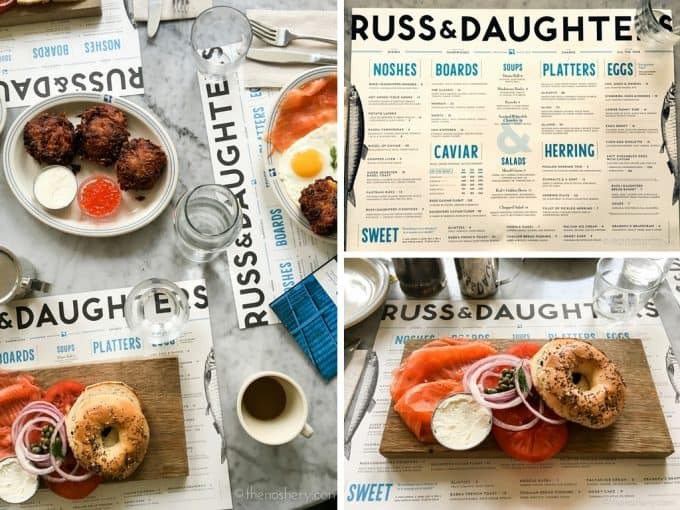 Russ & Daughters menu has something for everyone. You can keep it simple with one of the beautiful boards or go all out with a caviar flight. Yes, a caviar flight! We decided to keep it simple for breakfast. I got the classic board (gaspe nova smoked salmon, cream cheese, tomato, onion & capers) , Rebecca got the mensch board (smoked sturgeon, butter, tomato, onion, & capers) and Mary got the lower sunny side (sunny side up eggs, gaspe nova smoked salmon, & potato latkes). Everything was amazing but let me take a moment to talk about the latkes! The LATKES! 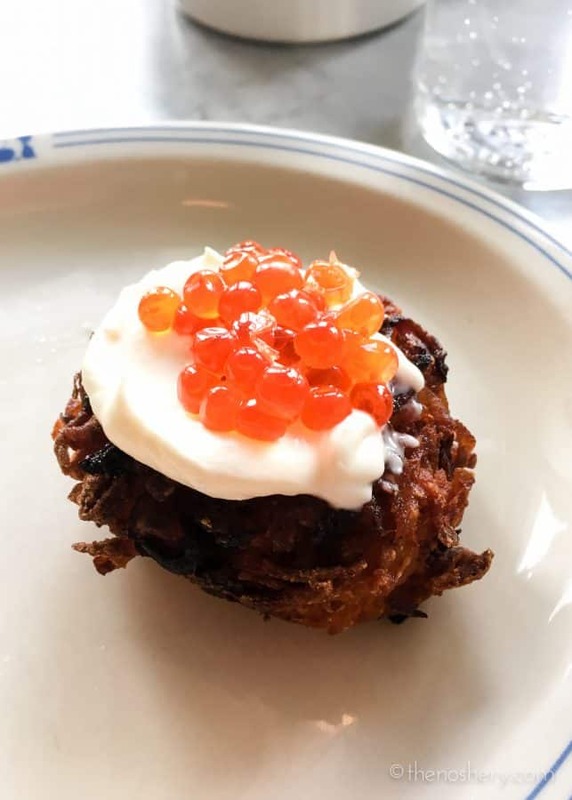 Fried potato cakes with creme fraiche and beautiful salty pearls of salmon roe that burst in your mouth. My eye rolled so hard I saw my brain! Everything that is served on the menu is for sale at their shop around the corner on Houston St. Bagels, smokes salmon, caviar, sturgeon, cream cheese, candies, halva and more! If you can’t make it to New York City no worries. They ship nationwide! Num pang is a small Cambodian sandwich shop NYC chain. If you’re a fan of Asian flavors and quality sandwiches this is a must visit. My personal favorite is the five-spice pork belly! It’s a tender glazed pork belly with pickled carrots, cucumber, pickled Asian pear, and cilantro on a crispy baguette. One of the best sandwiches I’ve ever eaten. They offer other sandwiches, rice bowls and salads. But I highly recommend the pork belly or pulled pork. What can I say? I like pork! 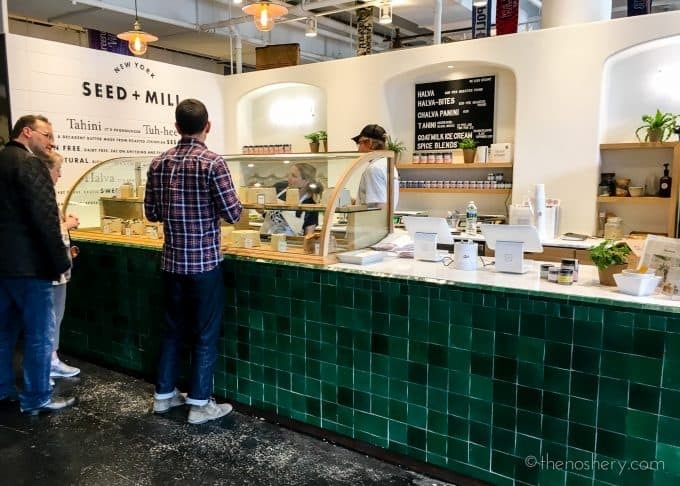 While exploring Chelsea Market we discovered Seed + Mill. At first glance, I thought it was a cake shop but upon a closer look, it was halva. Hal-what? I know right? That is what I said at first. Halva is a tahini (sesame butter) confection. It’s sweet, crumbly, and creamy at the same time. It crumbles in your hands and melts in your mouth. 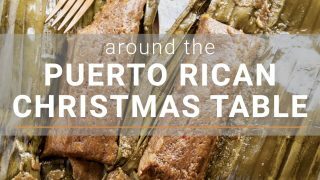 They add flavors like ginger, chai, cardamom, rose hips, fig, and dark chocolate to the halva. And that is just a few of the flavors they ofter. The also offer ice cream, spice blends, honey, and tahini. I was first introduced to Dough by my friend Joanne (Fifteen Spatulas) while in New York City back in January while tagging along on a business trip with my husband. Thank you, Joanne for introducing me to the best donut ever! A few months later I was back in New York and I needed my donut! 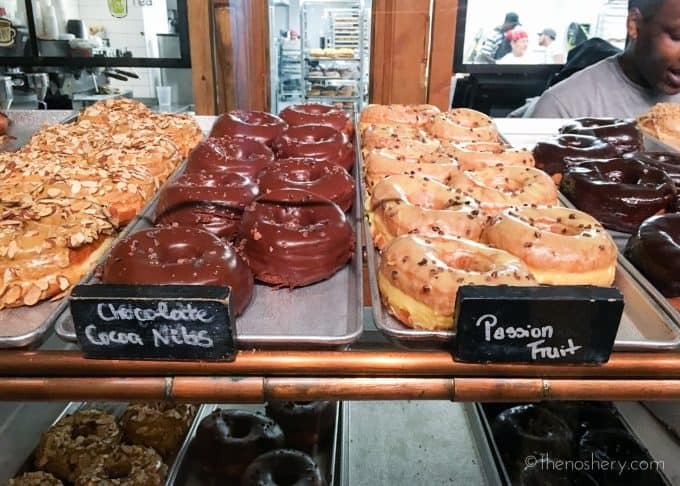 These donuts are as big as your face, tender, and they offer a wonderful selection of flavors. Flavors like toasted coconut, Nutella, mocha-almond crunch, hibiscus and my personal favorite passion fruit. I cannot say enough about their passion fruit donut! It’s sweet, tart, with crunchy cocoa nibs and the best freaking DONUT EVER! If I am offered an opportunity to eat some quality ramen I am in! 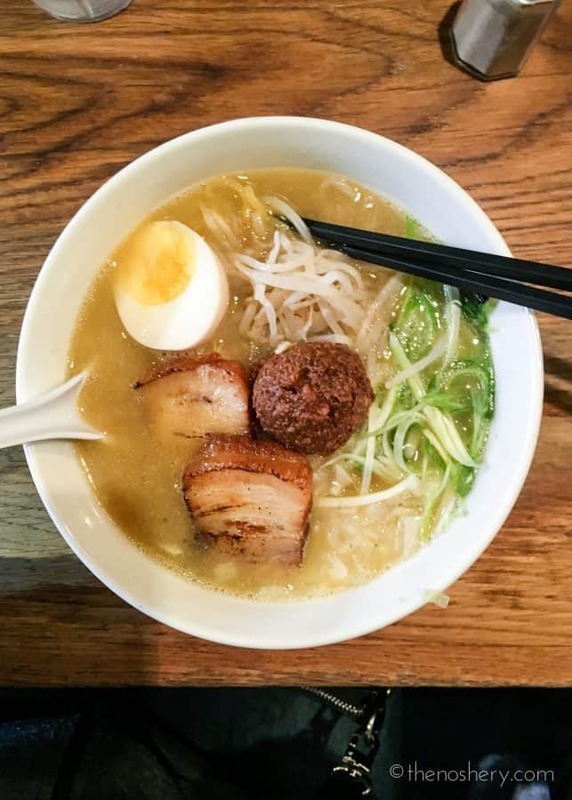 A few friends insisted that we check out Toto Ramen and we were happy to oblige. We went to the location on 52nd st. It’s in the lower level of the building and it’s TINY! They took our order at the door while we waited for seats to come available. We got three seats at the bar and got to watch the cooks in action. We started with an order of char siu pork buns. 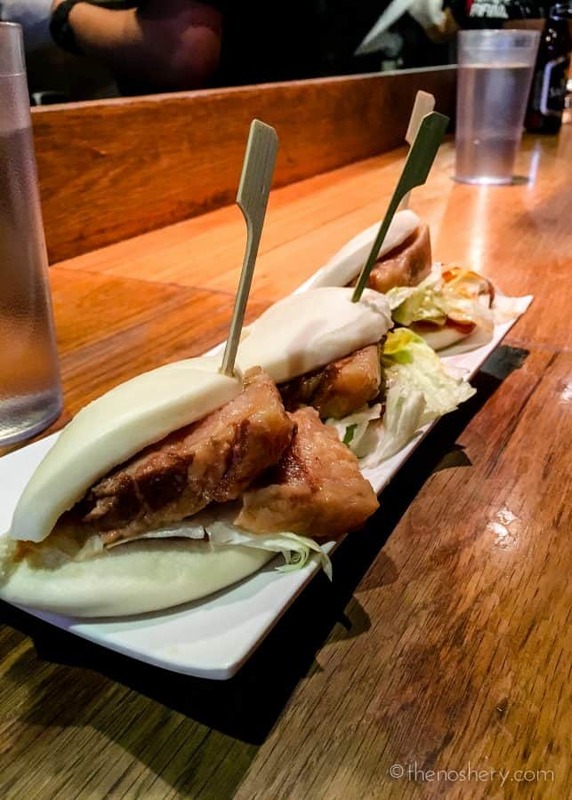 Because tender pork belly served on soft steamed buns are everything! They could be the answer to world peace. 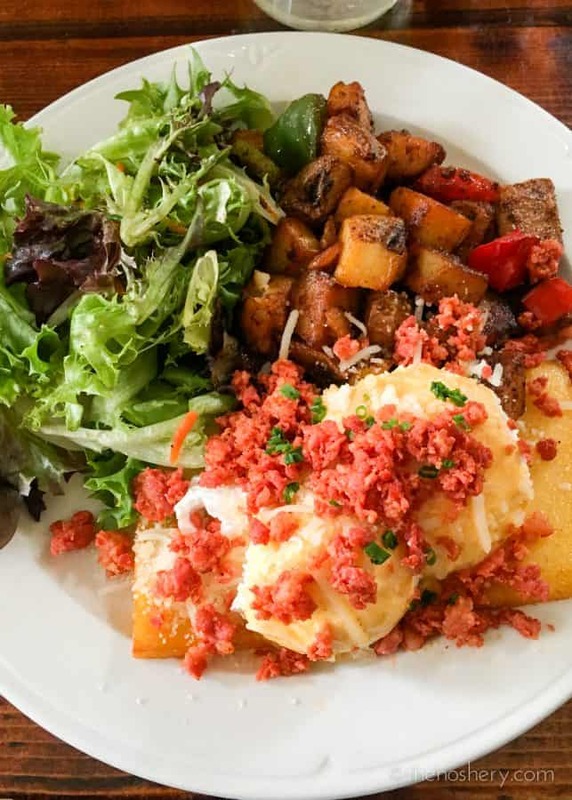 If you’re looking for a place for Sunday brunch while in New York City check out Poco in Alphabet City. 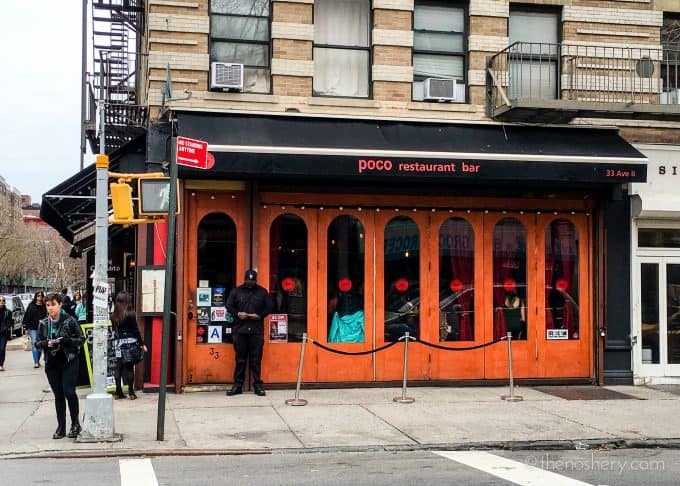 Poco has been named the best boozy brunch in New York City. Which means it’s popular so you must make a reservation. Poco offers bottomless sangria, mimosas, and bloody marys for two hours plus an entree for $30. Now you know why Poco is so popular for Sunday brunch. If you want to pass on the booze you can order an entree off their menu for $14. I ordered the Poco benedict with chorizo, manchego cheese, crispy arepa and poached eggs, topped with pimento hollandaise. It was amazing! 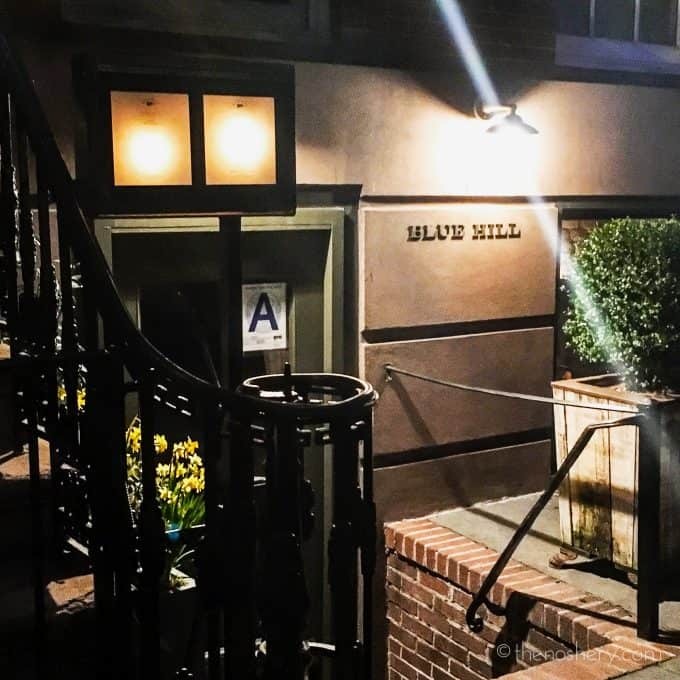 Our final eating destination Blue Hill, does not fall under the category of cheap eat so I will be sharing about it on another post. It was one of the most amazing dining experiences ever! 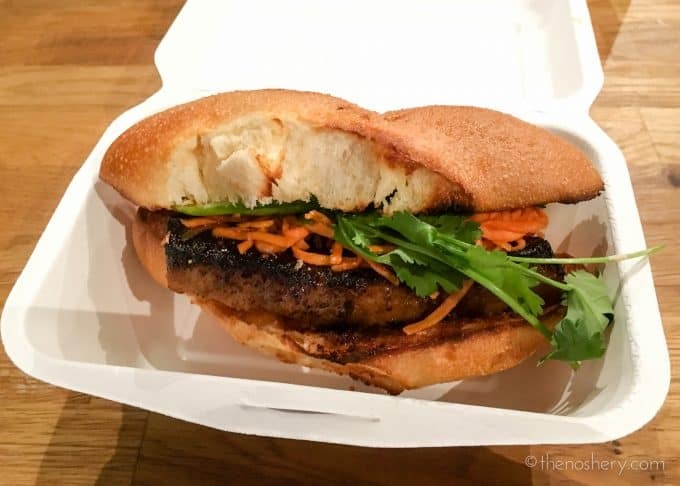 Do you have any New York City cheap eats that I missed? I am always looking to add more to the list! If you are planning a trip to New York City and need some help planning check out my post 7 Tip for Planning a Trip to New York City! Now I want to go back and ORDER ALL THE THINGS again! This is an awesome recap and I loved every bite of it with you and Rebecca.